Last Friday I confessed to being a Gleek...this week, I have another guilty pleasure to reveal: I still watch "Grey's Anatomy" and "Private Practice." I've been hooked since the first season of both shows, and no matter how ridiculous the plot lines get, I keep going back for more. 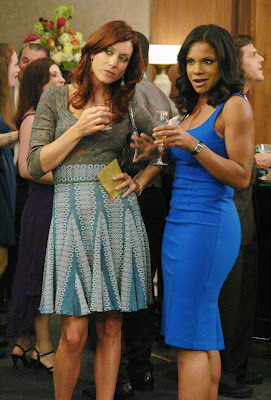 And at least with "Private Practice," I get to see some really cute style, specifically with the characters Addison and Violet. I'm not a huge fun of "business casual" attire that comes with having an office job, but these ladies pull it off in a way that's still creative and fun. Addison's looks are always a bit more polished, but they usually sport a bold pattern and chunky, modern accessories. Violet often has a bit more of a bohemian look going on, and putting these two together is a great balance this Libra loves. Bold B&W print, always so classy. A neutral outfit even I'd wear! One of my favorite of Violet's outfits. Really simple but I love the sleeves. My favorite of Addison's outfits: Love the high waist and the scarf blouse. Love the texture of Violet's blouse. Really love the way the pattern of the shirt matches the buttons of the bolero. Again, love the high waist and a little throwback to the '70s.